Sometimes when you gaze at something long enough, you continue to see the same image before your eyes, no matter where you look. I thought that this perhaps was what was happening to me, a few weeks ago, as I was strolling through Tsukuba’s Botanical Garden. 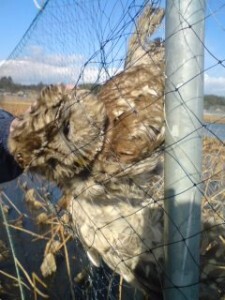 For several previous days, I had been doing research for a Tsukublog posting about owls in Japanese culture, after having seen a large owl which had died in the perilous nets around Lake Kasumigaura. My back-pack still contained a few books about owls and my cell phone was full of pictures of owl-motifed goods. 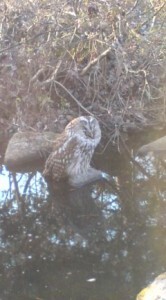 That is why I thought that I must just be SEEING THINGS when I looked to my right, as I was walking down a path, and saw what appeared to be a big owl, perched on a little rock at the edge of a tiny pond (see picture above). Stopping in my tracks, I strained my neck forward, and squinted, trying to better my focus. I couldn’t believe it. It WAS an owl, and by the slight blinking of its eyelids I realized that it was not a stone ornament, but REAL! Another thing that was certain was that that particular bird was not in very good shape. It made no attempt to fly away even as I, and then others, gathered to watch it from a few meters away. My guess was that it was sick, starving, or too old. When the botanical garden attendants got wind of what was going on, they came rushing to the scene. One young woman who had donned knit work-gloves (gun-te) came carrying a paper shopping bag. She said she was going to try and put the owl in the bag in order to help it. Surprised at her naivete, I warned her that birds of prey have sharp and powerful beaks and talons which could seriously injure her, and that the bird might intentionally go for her eyes. This dimmed her enthusiasm a bit, and before she ran off to get thicker gardening gloves and the box which I said would be necessary, I told her that I didn’t think anyone but an expert should try to handle the bird. I had been trying to call the Ibaraki branch of the Wild Bird Society (yacho no kai), but as it was Sunday, I couldn’t get through. A member of the society who often helps birds in this area, wasn’t answering his phone either. What were we to do? It was almost closing time at the gardens, and we couldn’t contact any expert bird handlers. I thought the best thing to do was just LEAVE THE OWL THERE, as it was not in any imminent danger from traffic or dogs, etc. Catching raptors for rescue is not only dangerous — it’s difficult! Once, years ago, near Hilo on the Big Island of Hawaii, my uncle (who lived there) and I were driving through a forested area. Suddenly, we saw a grey-whitish object in the middle of the road. We stopped the car. To our amazement, right before our very eyes, lay an io, an endangered bird, endemic to Hawaii, which lives only on the Big Island. My uncle, in his enthusiasm to help the rare hawk, rushed toward it. Though it could not fly, the io COULD run! In a flash it had disappeared into the thick brush, where it probably perished. From that experience, which has long haunted me, I knew that without EXPERIENCE, and two or three people with sheets or blankets to cover the bird with, we would not be able to catch the owl, unless it were really at death’s door. I was right. The garden staff member reappeared with a box and stronger gloves and approached the bird. Though extremely weak, it could still fly, a bit, and soared about 30 meters away into a low tree. The gung ho crowd pursued it and it then flew to another nearby tree. The stress caused by the presence of humans must have severely compounded whatever was wrong with the owl in the first place. I finally got through on the phone to a bird rescuer, who said he would be able to come the next morning. We left the bird where it was. The next morning it was dead. For the past 2 weeks I have been looking into what should be done in case one finds a sick or injured raptor in Tsukuba. To tell the truth, I have found that there are not many options. Unlike many European countries, the US or Canada, there is no network of trained volunteer rescue and care workers. If you find a raptor or bird in trouble, you should call the Regional Environmental Protection Office at 0298-67-8511, and then, if you can get through, and explain to them where you are. You can keep an eye on the bird until they arrive. You can also call the Ibaraki office of the Wild Bird Society of Japan at 0292-24-6216. Here you will get an answering machine, but they will listen to your message sometime that day. If it is a weekend, or if you cannot speak Japanese, please call me (Avi) at 090-4221-4194 and I will try to get someone over there to help. If a raptor needs immediate rescue (for example from a busy road), you shoud put on leather gloves (and maybe even goggles), and try to approach carefully. Try tossing a light blanket or sheet over the bird. It is better to have people approach from all sides, as the bird might be able to run or walk away, and evade a single rescuer. Be careful not to break the bird’s wings, and gently lift it and put it into a box (larger than the bird of course! ), preferably with a towel or piece of carpeting on the bottom. Then you can slip off the blanket as you close the lid (make sure air can get in). DO NOT FEED THE BIRD and LEAVE IT IN PEACE, as a human presence is extremely stressful. With the fast paced environmental destruction Tsukuba has and will be experiencing, we will probably be coming across more and more weak, starving or injured birds of prey. About poor birds I will make comment later. Yesterday(16/Feb.) I visited Hokutoji by bicycle, Kurihara area was rather big to compare my home area (Onogawa) against my imagination. I asked twice local Obasans about how to find Hokutoji. Kurihara area there are many old-chic-houses with Nagaya-mon(gate like house) or gate with roofs, those gate I like very much. Also there were few Kuras (old storage house), most of the houses with dark tiles roofs gave profound impression. Enjoying Ume-blossam I have a nice bicycle ride, two sketches. Hokutoji was very quiet also chic and neatly cleaned. From the temple I saw nice old Hinomiyagura (fire finding tower),very rare recently. Thanks Avi-san gave me information to have wonderful almost spring feeling cycling. I have not seen wounded birds before, except dead one. I could not distinguish Raptorial birds when they are flying, and I am very much regrettable that I have never seen wild owl even it is not so called bird of Tsukubashi. In my area there is Japanese style pub (Ippai-nomiya) named Fukuro (Owl) where many Fukuro dolls were decollated, even the Madam somehow looks like Fukuro. ,also has nice? voice of Fukuro (Not that Ofukuro:Japanese calling of great mother) and sharp nails. Because their they looks to have ears (Mimi). This information to treat wounded Raptor is very important. My grand daughter is keeping Cat, to treat him we are always very cautious about his sudden scratching. I twice ot his scratches,painful. For preparation of such occasion Avi-san wrote I put those important telephone numbers in my portable diary. Those birds caught in nets along side Lake Kasumigaura, I think it is pity purpose of those netting (prevent damage by birds to Renkon cultivation) is not working. I feel gap between those farmers and people who are working for protection of wild birds. There used to be Kasumi (net) birds catching methods in Japan (now it is prohibited) for getting birds as food. There are a few Wild-birds watching places in Japan and many birds watching people are enjoying photo-taking, hearing twittering etc, such kind places there are people feeding Wild-birds officially or voluntarily. I think it is a little bit against Nature. Recent bird-inuluenza those places are pasteurized or prhibited to visit.Sparrows have been had bad reputation in rice fields from farmers. Wild rabbit, boar, wild deer, and bear have been recently in Bimyouna (delicate) situation. Useful or not Useful? Harmful or not Harmful? Human being has been or will be selfish for other creatures.